The sixth issue of HA is hot off the presses and sure to please Icelandic design and architecture enthusiasts. This time around, the magazine contains nearly 140 pages of interesting content— which, when it comes to the Icelandic design scene, there’s definitely more than enough of. Our cover story is an interview with Jón Helgi Hólmgeirsson, the lead designer at Genki Instruments, and is accompanied by a photo essay that was produced in collaboration with Studio Fræ. Next, fashion designer Sunna Örlygs shares some insight into the process behind the graduation project she completed as part of her Master’s study at ArtEZ, including a video shot by photographer Magnús Andersen. Paul Bennett, the chief creative officer at IDEO who brought half the audience to tears with his personal DesignTalk at the 2017 DesignMarch festival, writes about his experience with our country and society in an open letter to Icelanders. Ásmundur Hrafn Sturluson and Steinþór Kári Kárason—the architects and owners of Kurt og Pí who just won the 2017 Icelandic Design Award in November for their redesign of the Marshall House—talk about how an architectural ideal shaped their idea to change the building’s function from the ground up. Grímur Sæmundsen, the CEO and founder of The Blue Lagoon, which was awarded Best Investment in Design, explains how collaborations with preeminent designers have played a big part in the success of the company. We also have a feature on the other illustrious design projects that were nominated for design awards: Reitir: Tools for Collaboration, the Vacation Rental Cottages designed for the Icelandic Confederation of Academics (BHM) by the architecture and design studio PKdM, the visual identity of the Cycle Art and Music Festival, as conceived by Döðlur, and the stairway at the Saxhóll crater, which was designed by the landscape and spatial planning consultancy firm Landslag. Writer and concept designer Bragi Valdimar Skúlason reviews the history of the Icelandic word for design—hönnun—and we take a look around the home of Loji Höskuldsson, a designer who’s aroused public interest with his Instagram photos of buildings designed by architect Sigvaldi Thordarson. Designers Sonja Bent and Elín Hrund Þorgeirsdóttir of Nordic angan introduce the Icelandic fragrance library that they are developing and jewelry designer Helga Mogensen talks about the challenges involved in working with driftwood. Product designer Brynhildur Pálsdóttir, who staged the project Leit að postulíni (‘In Search of Porcelain’) with ceramicist Ólöf Erla Bjarnadóttir and geologist Snæbjörn Guðmundsson, sheds light on the magic of seeing Icelandic gravel transform into a cast object. And, last but not least, Valdís Steinarsdóttir and Kristín Karlsdóttir of the design team Studio Trippin describe how they turn a previously unused by-product into an interesting designer product. Guðbjörg R. Jóhannesdóttir, a philosopher and lecturer at the Iceland Academy of the Arts, pens her Thoughts on Landscape, and explains why landscape matters to us as a phenomenon and concept. We’re also told about a new viewing platform near Brimketill, a naturally formed seaside pool on the Reykjanes peninsula that was designed by the landscape architects at the Landmótun design studio. It’s an example of a successful landscape project that enables guests to experience the crashing surf in a safer way than before. Auður Ösp Guðmundsdóttir answers questions about her Master’s studies in the oldest theater and costume design program in the world, in addition to which we get to see snapshots of a few of the many interesting design projects that make up the Icelandic design scene today, learning more about Örn Duvald and Anna Guðmundsdóttir at Malmö Upcycling Service, the textile designers Ýrúrarí, the goldsmith’s workshop Raus Reykjavík, as well as Epal’s collaborations with the multi-award-winning Margrethe Odgaard, Studio Holt, Gagn, Ragna Bjarna and HAF studio. Then we delve into the design stores Akkúrat and Ypsilon, which have been a smash hit with design enthusiasts of all ages, and get a preview of the new shop S/K/E/K/K, which is planned to open inside the Kópavogur Art Museum in the coming months. We’d also like to call your attention to the interesting interviews and articles on our website, www.hadesignmag.is, such as Bjarki Vigfússon’s piece on former bus depot-turned-food hall Hlemmur Square, Katrín Alda Rafnsdóttir’s interview with Icelandic fashion label KALDA, and the spotlight series Through the Looking Glass, which showcases the work of designers who have recently graduated from the Iceland Academy of Arts. 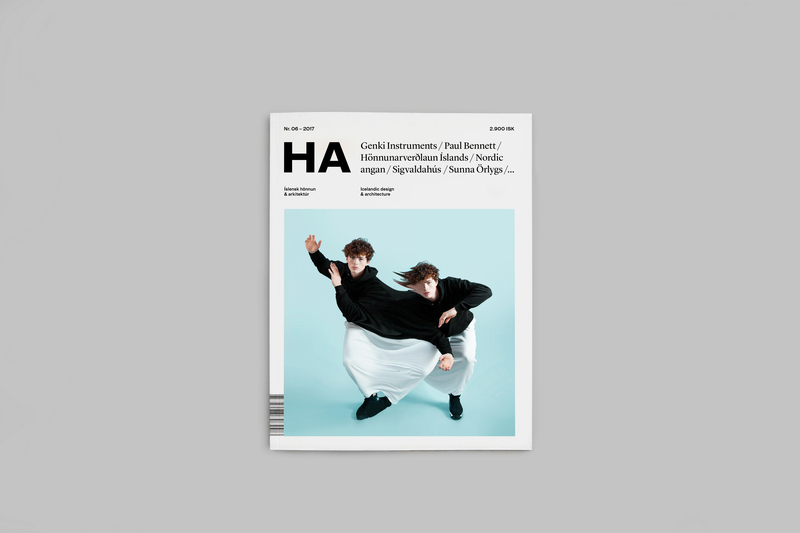 You can purchase your copy of HA06 here in our web-store or get a 10% discount and become a subscriber!